Join Impact Church as we serve this city! This special service day will be in lieu of our normal Sunday services. 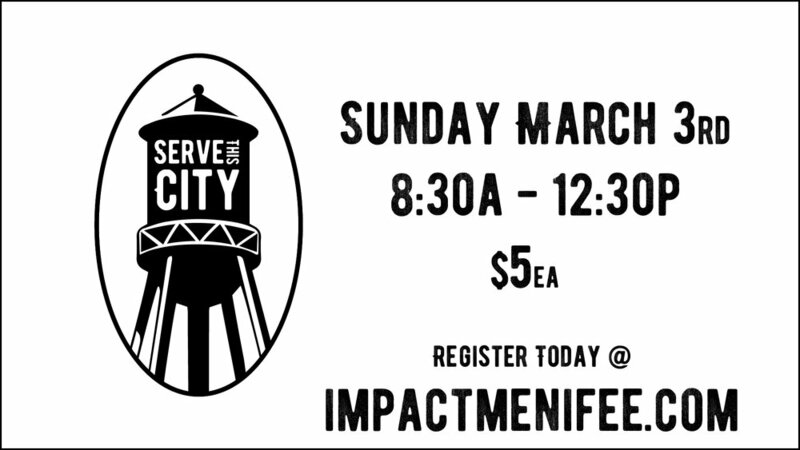 We are gathering this upcoming Sunday, March 3rd to Serve our City with projects for all ages and abilities. We will meet at the church at 8:30am, then head out to our work sites. Children are welcome to help, or they can enjoy our Impact Kids program during this event. Please register online today as this will greatly assist us in the planning for Serve This City. There is a $5 per person cost, and this will help to cover project supplies. Serving at Impact Church is a fun and fulfilling opportunity to develop relationships while using your gifts and talents. If you weren’t able to stop by the Connect Center yesterday for more details on Serving at Impact, it’s not too late! Click here and fill out the form to let us know of your interest. It’s that easy! Are you currently serving at Impact? Are you currently serving at Impact? Let us help you to find a place to serve and use your gifts and talents. Every ministry at Impact has room for volunteers to begin serving right away: Welcome Center, Ushers, Greeters, Impact Kids, and many more. Help Impact to make an even bigger impact - sign-up to serve today! Help Impact to make an even bigger impact - sign-up to serve today. The Bible says, “In our union with Christ Jesus he has created us for a life of good deeds, which he has already prepared for us to do” (Ephesians 2:10b TEV). These “good deeds” are your service to the world. Whenever you serve others in any way, you are actually serving God and fulfilling one of your purposes (Colossians 3:23-24; Matthew 25:34-45; Ephesians 6:7). 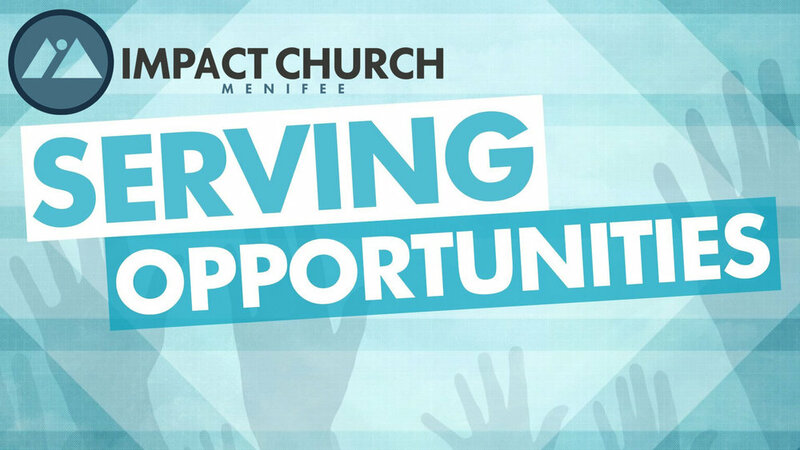 Serving at Impact Church is a fun, simple, rewarding time to develop relationships while using your gifts and talents. Click the link to check out all of the areas where you can serve, and then register today! Serving is a normal part of the Christian life. At the heart of it, volunteering is an essential component of the discipleship process in a believer's life. Plainly put, serving is discipleship. You are called, and you are capable. Register today to serve.